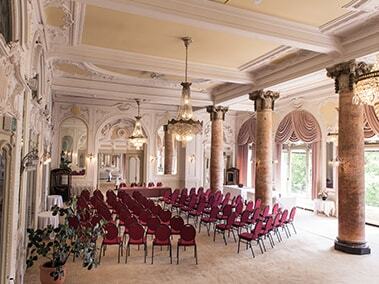 The Grand Lac Excelsior Hotel is an ideal location for your conferences and banquets on the lakeside. Under one hour away from Geneva Cointrin airport via the motorway or by train, the establishment is only 30 minutes away from the Lausanne TGV terminal station, and 5 minutes from the Montreux railway station. 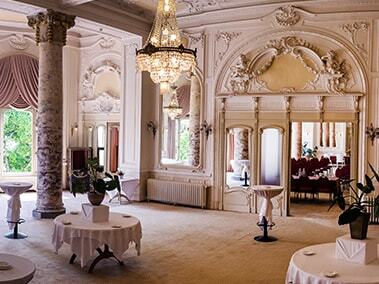 The hotel has several banquet and seminar rooms, entirely flexible, in the belle Époque style with original pillars, ceiling mouldings and decorated ceilings. There is also plenty of natural light and views over Lake Geneva, easy access and a personalised Wi-Fi connection. The tree rooms put together can accommodate up to 650 people. Depending on your requirements and wishes, we will offer a bespoke solution, making available our rooms and the various areas of the hotel. Various installations and preparation of the rooms can be considered, so do not hesitate to contact us and to clarify your needs. Surface 204 m2 / 2,200 square feet. Length 17m. Width 12m. Height 5.5m. Surface 240 m2 / 2,600 square feet. Length 20m. Width 12m. Height 5.5m. Surface 75 m2 / 800 square feet. Length 12.5m. Width 6m. Height 5.5m. Please ask for the seminars manager.